2002 upper deck julio lugo. the future dodger turns it at dodger stadium. in one of many trades between the dodgers and devil rays in 2006, julio lugo cost the dodgers joel guzman, a sort of modern day billy ashley or chin feng chen. 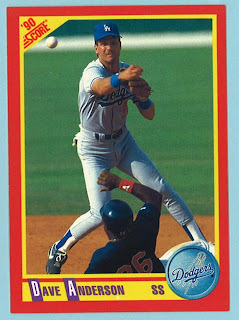 i really only posted this card to give a big fat hint regarding the question i posed earlier - aside from andre ethier, who are the other two asu sundevils to play for the dodgers and wear number 16.
ok, so it's not a dodger. and it's not taken at dodger stadium. it's still perfect. this is one of my favorite cards. 1991 topps carlton fisk. i did not buy any 1990 topps. the first year in 12 years that i didn't buy topps. i hated that set. didn't care for 1988 or 1989 at the time, so couldn't bring myself to buy 1990 - the third year in a row of bad design. 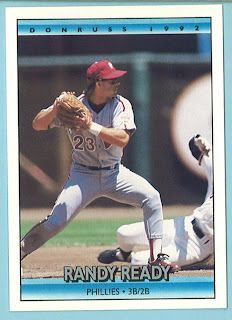 when i saw the 1991 cards, though, i jumped back in with a fury. better design, better photos. this was baseball. so here's hall of famer carlton fisk waiting for the ball while big daddy cecil fielder bears down. a dave bergman type in the background exhorting cecil to slide. perfection. blogosphere participation, part three - thorzul will trade and you may win! quite a while back, i worked out a small trade with thorzul will rule. 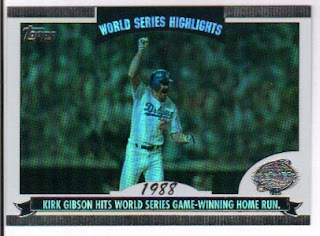 i knew there was a reason i had kept some 1992 fleer ultra around. 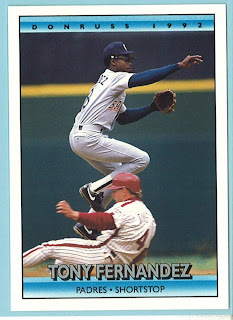 anyway, i sent a few cards from his want list, and he reciprocated with some 2007 topps i needed, plus these boys in blue. 2007 upper deck goudey nomar garciaparra. 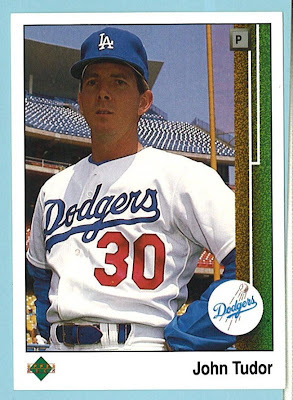 i have missed nomar’s cards in the topps issues as i mentioned here, so i tend to hoard his other dodger cards. nomah! 2007 topps allen & ginter andre ethier. acquired for the board game (milton bradley – for whom i will always be cheering) and the subject of one of my favorite FJM posts (ripping plaschke to high heaven), ethier is the third arizona state sundevil to play for the dodgers and wear number 16. free cards of all 3 and more to the first person to name the other two in the comments below. bill, thanks again for the trade, and may thorzul’s reign be one of peace and prosperity. on the field for camera day, it's candidate jim eisenreich and his 1999 upper deck card. fans are roped off while the players walk around inside a viewing area. camera day was the first time i was ever on the field at dodger stadium - i was about 8 or 9. anyway, jim seems to have his campaign strategy down: eye contact, firm handshake, and lick those lips before kissing the babies. nice shot of the right field pavilion and scoreboard in the background, too. 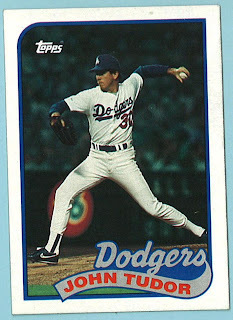 1989 topps john tudor. one of night owl's awesome night cards. 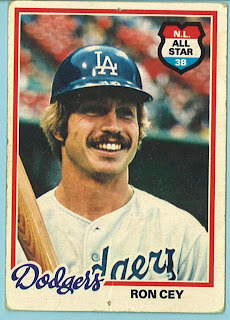 1978 o-pee-chee ron cey. the second of my favorite cards i have posted, and they both happen to be 1978 o-pee-chee. i have already extolled the virtues of the set design, and i can't wait to see this site take off. i used to spend some time every other summer in canada, including 1978 which just happened to be the year i really started collecting. 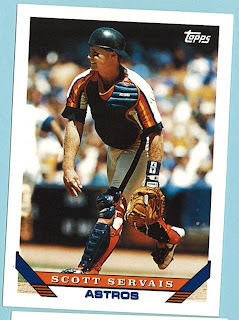 this particular card once adorned the wall of my bedroom. if you look closely, you will see the thumbtack holes on the top and bottom. this card has been with me for 30 years, traveling from the great white north to southern california and on to minnesota. seeing this card now just makes me smile. like the penguin. trick or treat turns out to be treat! thanks so much to tribecards aka indians baseball cards always for the fantastic box of treats. i had steeled myself to expect tricks - lots of giants cards featuring jack clark (that would have been a double trick) and gary lavelle, but all i got were treats. some really cool treats, too. here are just a few of them. 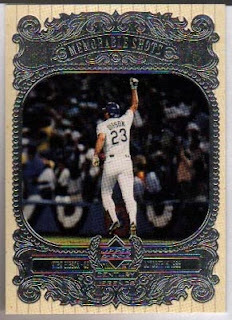 we'll kick it off with italian american superstar slugger mike piazza and his 1996 pinnacle card. the strongest man in so-cal appears to be practicing for his pert shampoo commercial. 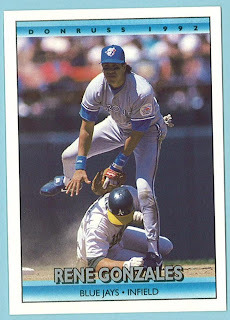 1995 pinnacle zenith antonio osuna. i have a soft spot for antonio. he used to wear a chain around his neck that had a license plate sized medallion on it. good times. 2000 stadium club devon white. devon is the kind of guy i forget played for the dodgers. 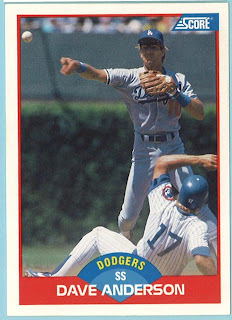 i love this card because it shows the outfield wall mural, with gibby reaching for that backdoor slider, and it features the dodgers' alternate hats and jerseys. seriously. do the yankees wear alternate jerseys or hats? no. why mess with the classic look. 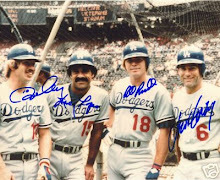 i am glad the dodgers don't break this stuff out anymore. 1992 pinnacle tom candiotti. i'll have to try this grip out this weekend (if it doesn't snow). i typically grip the seams with two fingertips when i throw a knuckler. that's probably one reason why it rarely works. 1984 topps bill russell. 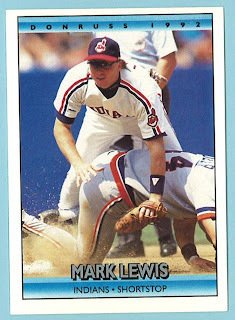 by this time, he was the last of the gcrl infield still with the team. who'da thunk it. 1977 topps dave(y) lopes league leader card. those are two ornery looking men. thanks again david! look for some wahoo in the near future. 1989 upper deck john tudor. tudor is bringing back the windbreaker under the jersey look that was so popular in the 70s. 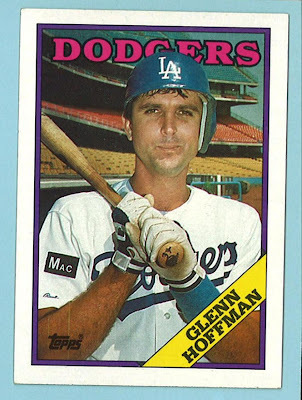 1988 topps glenn hoffman. 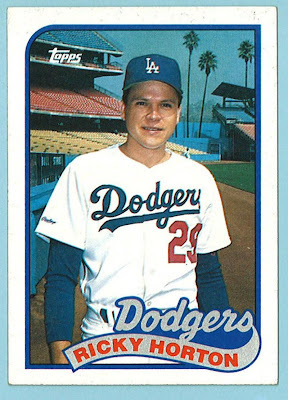 the future dodger manager. if only someone had thought to write something crude on the knob of his bat, he could have trumped billy ripken by a year. 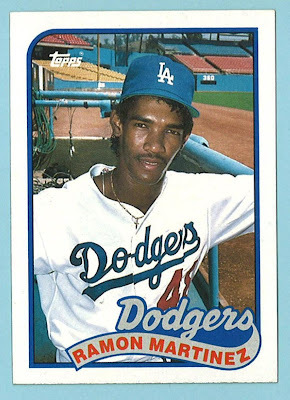 1989 topps ramon martinez. his rookie card. i guess they don't let rookies out of the dugout for pictures. 1989 topps ricky horton. 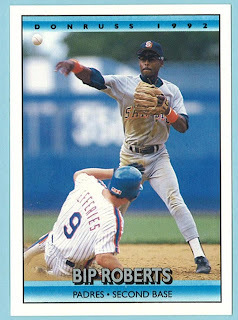 another 1989 topps, but this one has the money shot with the palm trees. 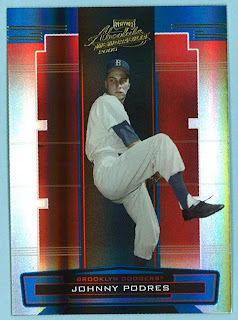 being a team collector, it bothers me when many of the cards of players from the same team in the same year include the same pose, or the same backdrop. 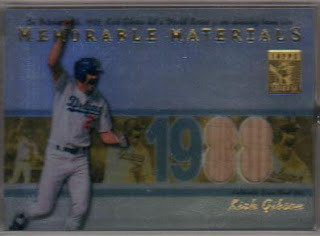 the 2007 topps dodgers are a good example. but that will be another post. or several. there's a play at the plate! i came across these cards while going through some 90’s stuff. 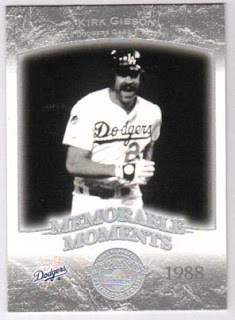 i really enjoy the continuation aspect that the gaetti card brings to the play. 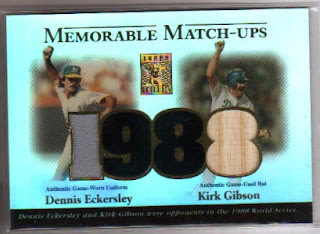 i wish there were more cards like these – just imagine if other notable home plate plays or collisions had been captured this way – aj pierzynski/michael barrett, gary carter/brian downing, mike scioscia/jack clark, jeremy giambi/jorge posada, and, of course, pete rose/ray fosse. if topps did a card like this today, it would be one of their ‘classic combination’ cards which just means these two players were photographed in close proximity of each other during a game. i haven't posted about the other team i collect - the twins. actually, i would say i semi-collect them. i moved to minny about 11 years ago. i laughed the first time i entered the metrodome to see a game - it seemed so fake and plastic. anyway, the twins are the easiest way for me to see games, although i do try to road trip once or twice a year. joe mauer is the local boy done good - he's from saint paul and is the most popular twin locally, in my opinion. 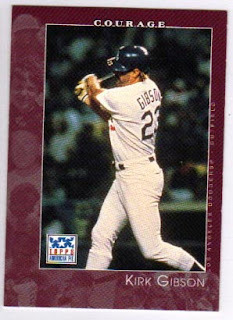 here, on his 2006 upper deck card, he revels in the dirt at home plate in dodger stadium during the twins first chavez ravine appearance since the 1965 world series. 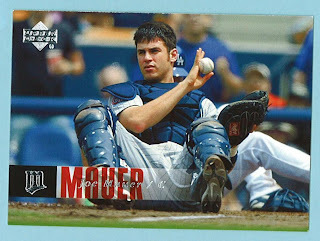 i went to every game of the dodgers' series with the twins in 2006. mauer destroyed us, posting 5-rbi in one game and 5 hits in another. i couldn't help but applaud. way before i even thought about doing this, i read a few card blogs fairly regularly. i enjoyed reading about other people's opinions regarding cards since all of my card collecting pals have moved on. i traded with ben henry a couple of times and began to feel the joy of trading again. i arranged a trade with william at budget sports card collector, and then participated in a 2005 playoff absolute box break with gellman at sportscards uncensored. as luck would have it, one of the 4 teams i drew was the dodgers! here are the two cards i received as a result - johnny podres and a shawn green/rickey henderson team tandems bat card. good times. but it was jim at taste like dirt that really got me going. his passion for the a's was obvious, and i realized i could pull some cards from his want list, along with some a's, and help him towards completing a set or two. i sent him a bunch of cards blindly, and he soon reciprocated. thanks jim. so, as they say in philly, why can't us? i have a couple of other trades in the works, and i can't wait to do more. my want/need list is linked to the right, so let me know if you need a certain team, player or set and let's trade! on his 1989 score card (above), dave anderson is shown throwing the ball to first as mark grace slides in to second. it's the double play turn - one of my favorite plays in all of baseball. score must like the way anderson turns it, because the very next year, on his 1990 score card (below), there's he is again, firing the ball to first as he avoids the slide of the lead runner. at least score used different games and plays. not sure if the same holds true for the next group of cards. 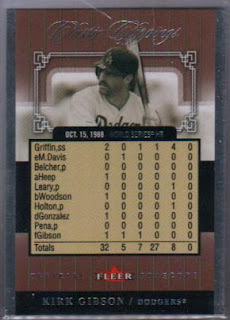 i posted orlando cabrera's 2002 topps total card (below) in the second installment of 'let's turn two'. orlando is at dodger stadium, mid-air, having already made the throw to first. 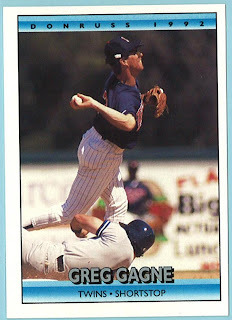 here is his 2002 fleer premium card. anything seem familiar? the picture is taken from a slightly different angle, but it is the same play. 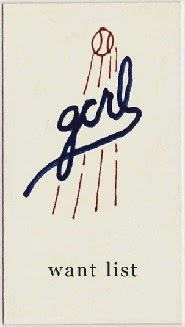 cropped a bit strangely, but still a nice card. 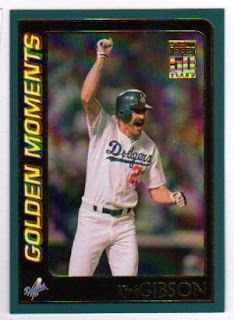 topps goes to the same well again on his 2002 gold label card. it's a bit later in the play, as orlando is coming back to earth. i will assume that all other pictures of orlando that were considered for his 2002 issues showed him picking his nose or adjusting his cup. then there is bret boone shown on his 2002 topps stadium club card as pudge rodriguez slides into second. and here is his 2002 fleer ultra (below), also taken at arlington with pudge rodriguez sliding in, cleats high. looks like it could be the same play. so what's my point? i don't really have one. i like these cards despite the repetition. what would hee seop do? when i find myself in times of trouble, hee seop choi comes to me, speaking words of wisdom, let it be. and in my hour of darkness he is standing right in front of me, speaking words of wisdom, let it be. thanks hee seop. adios jeff kent. i don't blame you for striking out looking in your final at bat. it was a bad call. but you won't be missed. you'll be back chad - you'll get another shot. tim mccarver knows not of what he speaks, matt kemp. give it a ride everytime. to end, i was really bothered that fox synched the gibson homerun video to the radio broadcast audio. 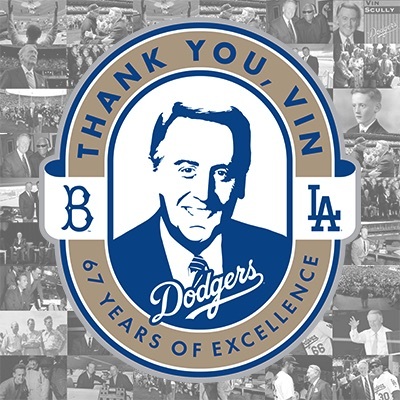 i would rather have heard vin scully's tv call than jack buck's radio call. i wonder if having joe buck in the booth was the reason for the swap. stupid fox. after leary, it was brian holton and then alejandro pena who came in and held the a's while the dodgers pecked away at the lead. singles by mike (general soreness) marshall, john t-bone shelby, and mike scioscia brought the score to 4-3. my dad and i weren’t going anywhere. pretty soon, it was the bottom of the 9th. that meant eckersley. automatic. scioscia pops out, hamilton strikes out. davis walks. a glimmer of hope! when we recognized that it was gibson coming up, we lost it. everyone was thinking home run. at least i was. then came the foul balls. the stolen base. the full count. and then the home run. the pavilion was rocking. both my dad and i had our cameras out with the zoom lenses and were trying to take pictures. i saw the fist pumps through my view finder. as soon as gibson scored, i stopped taking pictures and looked around. people were hugging each other indiscriminately. laughing. cheering. crying. it was fantastic. 20 years ago today. i still don't believe what i just saw. the pictures didn't really turn out - i was shaking too much and the pavilion was bouncing, so they turned out blurry. that's ok though. i have the cards. we were sitting in the right field pavilion, about 7 rows up or so. we chanted "steroids" at jose canseco when he was in the field. he flexed his biceps for us. we did this partially because it was done by boston fans in the alcs. bud selig must not have watched any playoff baseball that year, since he had no idea until just a few years ago that steroids might be a problem in major league baseball. but i digress. 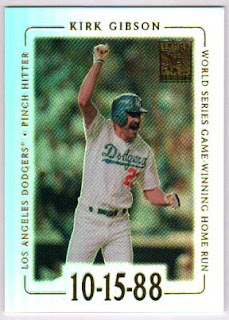 i remember the excitement as the game got underway, which quickly led to elation as mickey hatcher went deep in the bottom of the 1st, almost catching up to steve sax on the basepaths. 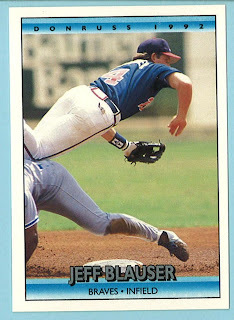 we were quickly brought back down to earth as tim belcher walked the pitcher (dave stewart) en route to giving up a grand slam to jose canseco. this remains one of the hardest hit balls i have ever seen. top 3 easy. i really don’t remember what my expectations were. my nervousness was spent after the nlcs against the mets. i knew, obviously, that the dodgers were the underdogs against the a’s, but as a fan i had hope. sure, it was lessened after the grand slam, but as tim leary came in and held the a’s, there was still hope.